Whether you're looking for a long-term project or to help out for a few hours, St. Andrew's has many opportunities for you to join us in service to our community and the world. All ages are invited and encouraged to participate in our outreach projects. 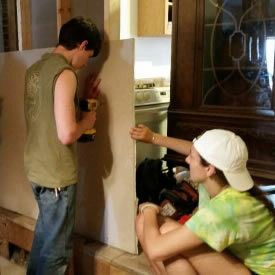 Click here for information about current outreach projects with which you can help. St. Andrew’s is active in the Kairos Prison Ministry which takes place in various state prisons twice a year. The goal of the program is to create a self-sustaining Christian community within the prison. Team members receive 35 hours of training prior to entering a prison. You can support Kairos by baking cookies (Each team member takes 100 dozen. Click here for recipes. ), praying for the teams, or supporting a weekend financially. For more information click here or contact Jim Neff, 804-426-5305 or jneff1185@gmail.com. Over a 20 week period during the winter months, homeless individuals can find warmth and safety thanks to an ecumenical and community effort. Doors are opened and home-cooked meals are served. Anyone over the age of 16 can assist with the onsite shelter program. Visit the "Current Outreach Projects" page for more info or contact the church office, 595-0371 or saec0371@gmail.com. Members of the Prayer Shawl Ministry create shawls that will bring hope and peace to people at critical moments in their lives. Prayers of healing, comfort, love and support are shared or offered as the shawls are knitted or crocheted. All are welcome to participate by knitting or crocheting shawls or by providing yarn. To learn more or get involved, contact the Rev. Carol Chamberlain, mothercarolee@yahoo.com, 595-2170. 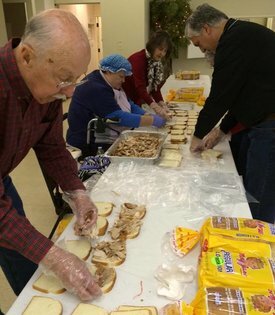 This annual mid-December event results in the assembly of over 500 brown bag lunches which are distributed at a Christmas party for the homeless in Newport News. Work begins in the fall with donations of hundreds of drinks, cookies, crackers, containers of applesauce, desserts, loaves of bread. On the day of the assembly, day school students, teachers, parishioners, friends, and community members come together in the Parish Hall, divide the tasks and go to work. For more info, click here or contact Bill Wilds, 595-0371 or saec.bill19@verizon.net. Hilton Area Churches Vacation Bible School is an ecumenical program which includes five area churches. It began over 25 years ago and continues to be an important collaborative ministry each summer. 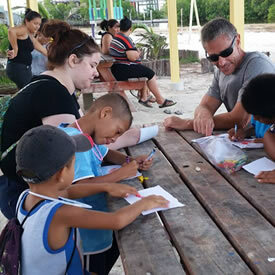 Adult and youth volunteers begin preparing months in advance to ensure that the children attending benefit from an enriching Christian education experience. Our volunteers work alongside volunteers from other churches and together share in the mission to communicate God’s love to all. To learn more or get involved, contact the Parish Office, 595-0371 or saec0371@gmail.com.